It was the moment they had longed for. 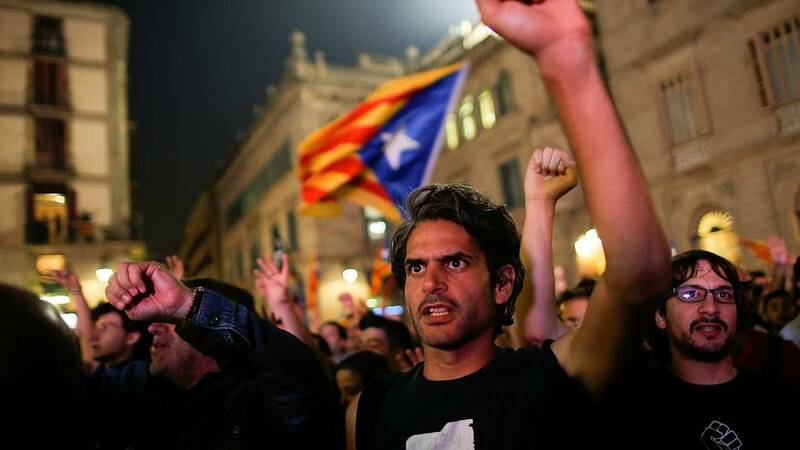 Crowds of independence supporters celebrated long into the night outside Catalonia’s government headquarters in Barcelona on Friday, following the unilateral declaration to split from Spain. Madrid’s moves to thwart the breakaway didn’t spoil the party, with Catalan flags flying and revellers singing and dancing with joy. But they weren’t the only ones on the streets of the Catalan capital. Catalonia is deeply divided and defenders of Spanish unity also marched through the streets of Barcelona. The independence declaration has not only been rejected within Spain. Several European countries, including France and Germany, as well as the United States have also said they won’t recognise it. The same goes for Mexico whose President Enrique Pena Nieto has made clear that he will stand firmly with Spanish Prime Minister Mariano Rajoy. Madrid declared the referendum on October 1 illegal. And while the vote endorsed independence, it drew only a 43 percent turnout as Catalans who oppose a breakaway largely boycotted the ballot. This is Spain’s gravest political crisis since the return of democracy four decades ago and many fear it could escalate further into violence.